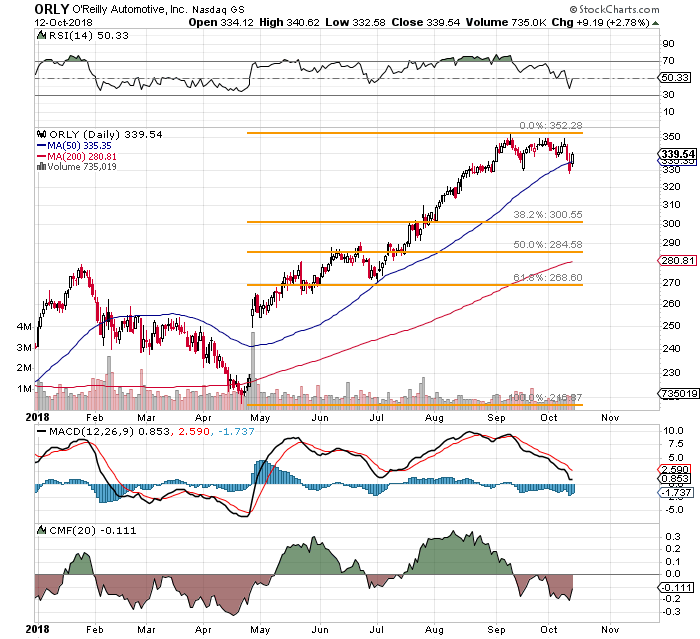 Have you noticed O'Reilly Automotive (ORLY - Get Report) ? They report next Wednesday, nine days from now. For those unfamiliar, this firm sells after-market auto parts and automotive tools. Their customers are the kid fixing his own car in the driveway next door, as well as the business that you left your car at this morning. Why am I showing you this? While the rest of our equity marketplace, for the most part, is trying to hang on to their various 200-day SMA's, ORLY is still clinging to it's 50-day SMA. The other auto-parts dealers? Advance Auto Parts (AAP - Get Report) , and AutoZone (AZO are both also hanging around the 50-day, but AZO is even less affordable for retail investors. ORLY is the only one of the three that has seen four consecutive quarters of increased fund ownership, and the only one of the three that retains 3% ownership by management. I like to see funds on the bid side, and I like it when management has skin in the game. Still, this is an expensive name with a ton of debt that remains heavily reliant upon inventories that can be sold at or near where they should be in order to keep the liquidity wolf at bay. This is why I do not consider this an equity play. However, there should be some Fibonacci support close to the $300 level, and then more at $284. The 200-day SMA currently comes into play at $280. What a trader could do is to sell (write) a $300 November put (last sale: $2.95), or a $280 November put (Last sale: $1.41), to at least expose oneself to what could be a past-peak auto trend, but at greatly reduced risk. This is simply a premium capture play, but the trader must be prepared mentally to have to purchase the shares at the strike price in the event of a more significant correction by mid-November. That means either sufficient cash, or available margin, or simply buying back the put ahead of expiration if necessary. The trade-off for the reduction in risk is the reduced benefit on an upside move by the shares, but that was not the purpose of this mission in the first place.